It is always fun to be walking along a Kauai beach and discover a Hawaiian monk seal sunning on the sand. Residents are very protective of Hawaii’s state mammal because they are one of the only two remaining monk seal species on Earth and their habitat is limited to the Northwest Hawaiian Islands and the main Hawaiian Islands, especially Kauai, Oahu and Molokai. The Hawaiian monk seal is the only seal native to Hawaii, and, along with the Hawaiian hoary bat, is one of only two mammals endemic to the islands. They are on the endangered species list with a total population of approximately 1,400. The bad news is that the larger population that inhabits the northwest islands is declining. The good news is that over recent years the number of pups born in the Hawaiian chain has slightly increased. Hawaiian monk seals spend most of their time at sea foraging in deeper water outside of shallow lagoon reefs. They hunt fish, lobster, octopus and squid in deep water coral beds. Tiger sharks, great white sharks and Galapagos sharks are their predators. To rest and breed they move onto the sand and volcanic rock. This is when we humans get the chance to observe them. Sandy beaches are also used for pupping. Females reach maturity at age four and bear one pup a year. Births occur between March and June. Mother monk seals are dedicated to their pups and remain with them for the first five or six weeks of their lives. The pups nurse but the mothers don’t eat anything during this time consequently losing hundreds of pounds. Once the pup is weened, the mother deserts the pup, leaving it on its own, and returns to the sea to forage for the first time since the pup’s arrival. Following is a video reflecting just how protective a mother monk seal can be when confronted by an intruder. They’re back! Each year Hob Osterlund, author of Holy Moli, Albatross and Other Ancestors, has a contest to guess when the first albatross will return to Kauai. This year one eager bird (not the one shown in the photo) was spotted at a Kilauea property on Thursday, November 8th! A second sighting happened at the Kilauea Lighthouse on Friday. That means many more will follow over the next few weeks. We can hardly wait to see who shows up on Kaweonui Road. Those of you who have been following my blogs know how crazy I am about the Laysan albatross. In fact, if you go to my blog category list you will see that I have already written ten blogs about these birds. Therefore, I won’t go into much detail, here, about what makes these birds so special to me and others on Kauai. You can read about that in my other blogs. But, I did want to share with you a short documentary that Hob Osterlund has created, Kalama’s Journey. She has been working on the footage for this video for a couple of years. Those of you who have been to our vacation rental, Honu Point, will recognize the opening shots. A must-see for anyone visiting Kauai, especially if you are a bird or whale lover, is the Kilauea Lighthouse. It is a photographer’s dream location. Sweeping, panoramic, whitewater views, with sea birds circling above and burrowing on land, one can not help but get an impressive shot of the beauty that makes Kauai so special. Even more exciting are the humpback whales that cruise by in their pods during whale season (November to April). It is not uncommon to witness humpback whales breaching or pounding their fins on the surface of the ocean at this north shore whale sanctuary. If you are staying at Honu Point, the Kilauea Lighthouse can be seen from the house. It sits 180 feet above sea level on the most northern piece of property on Kauai. The original lighthouse (circa 1913) is no longer in use but it is an historical landmark. Today a modern light shines out to sea. 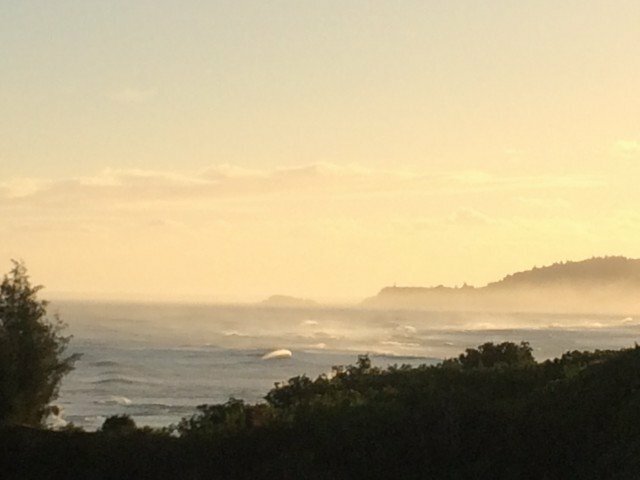 Here is an early morning winter view from Honu Point. When I woke up this morning and saw clear skies and sunshine I knew I needed to step away from the computer for awhile and go on a much needed walk. What better place than Hanalei Bay; where the lush, green mountains meet the sea! Arriving at the bay around 9:00, or so, I found a few people who had the same idea. There was a soft breeze and the sun was slightly veiled by the clouds – perfect for sun bathing. Warning: Don’t let the clouds fool you. I got my worst sunburn on a day just like this. I felt rather conspicuous carrying my iPhone with me but I wanted to take photos so you could vicariously walk with me. Enjoy. 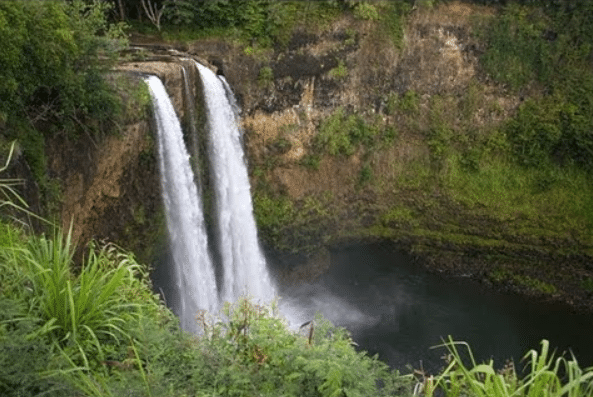 Wailua Falls and ‘Opaeka’a Falls are two of the most accessible falls you are able to view on Kauai, Hawaii. They are both breathtakingly beautiful in their own way, especially after heavy rains in the mountains. This week I decided to drive a few miles out of our way to check out both falls. We have had an exceptional amount of rain this week and so we knew the falls would be especially impressive. We were not disappointed. This is a photo of what Wailua Falls typically looks like. It often has two streams overflowing the ridge. In fact, years ago our grandkids walked out to the top of it and looked over. A real Kodak moment. This week, however, was a different view all together. Wailua Falls was putting on quite a show. This time when I picked up the kids from the airport and took them out to see it, their only comment was, “That’s a lot of water!” Indeed. Wailua Falls is about 173 feet tall; taller than Niagara Falls! The pool is 33 feet deep. There used to be trails down to the base of the falls but unfortunately the paths have not been maintained and have been fenced off by the State for liability purposes. To get to Wailua Falls, take highway 56 through the town of Hanama’lulu (just outside of Lihue). Watch for the signs and turn north onto Ma’alo Road. Wailua Falls is a short four miles from the turnoff. There is a small parking lot where you may park and then walk a short distance back to the railing with a view looking right down at the falls. It is a great stop to or from the airport or on your way from one side of the island to the other. ‘Opaeka’a Falls is a little further from the viewing area but definitely worth a stop. These 151-foot falls flow year round. Even with the rain they seemed to be flowing much like normal this week. To view ‘Opaeka’a Falls turn toward the mountains from Highway 56 on the north side of the Wailua River (Kuamo’o Road). Drive about 3 miles until you reach the large parking lot on the right hand side of the road. Walk a short distance to view the falls. Across the road is a lookout for the Wailua River. Up this same road, on the left hand side, before you reach ‘Opaeka’a Falls, you will find a heiau (sacred temple) called Poli’ahu. Legend states that it was built by Menehune, the legendary people of small stature, and was devoted to the interests and activities of the gods, demigods and high ali’i. There are lots of native and Polynesian-introduced plant species in the area, as well as a Wailua River Lookout. Past the falls is the entrance to Kamokila Hawaiian Village, a 4 1/2 acre plot with numerous huts depicting early Hawaiian life. There is a small entrance fee. So, if you want to see a waterfall up close and personal, be sure to check out these two sites before leaving the Garden Island. Your photos will be worth a thousand words! There are many reasons to visit the Grove Farm Museum on Kauai, Hawaii. Perhaps you are interested in the history of the sugarcane industry on this tropical island. Or, you are curious about the Wilcox family. You could be trying to escape the rain or filling the hours between check-out and a late night flight. Whatever the reason, Grove Farm Museum is a unique look at life on Kauai in the 19th and 20th century. If you are ready to experience Kauai as the ancient Hawaiians did, be sure to visit Limahuli Valley on the north shore of Kauai. This beautiful valley looks much like it did 1,500 years ago when the Hawaiians called it home. Limahuli Valley is one of of the last easily-accessible valleys with intact archaeological complexes, native forest, pristine stream, and the presence of the descendants of the valley’s original inhabitants caring for it. It is one of the five gardens of the non-profit National Tropical Botanical Garden.